A few summer temptations lately! It really is strawberry season. I love strawberries and that of course means oodles of cream poured over the top. I am seeing strawberries in the supermarket at the moment, of the most fantastic proportions. Have they done something unspeakable to them to make grow so big! Walking along the lane, in the hedgerow I am spotting the most sweetest tiny tiny wild strawberries growing. The flavour is intense and reminds me of some strawberry flavour sweets I had when I was little. I have to remember to leave some for the wild life. Oh and spotted on the common, this fabulous red car sitting in the car park. I mean look at it, does this not say ready to go adventuring. Doesn't it just 'need' a red suitcase to match. I had to restrain myself for checking for keys!! I could just imagine taking off for an adventure sitting in this with my vintage suitcases stacked prettily in the back and ready to go! Yes please! 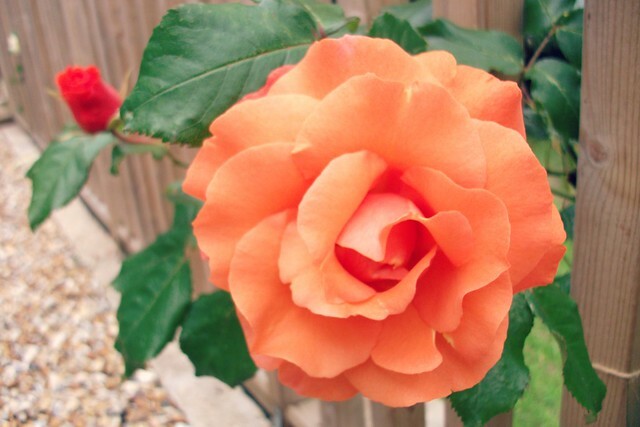 A beautiful new sweet smelling orange Rose growing by my balcony. I have to keep going and breathing in the sweet smell. Reminding myself to buy some Rose oil. I put a few drops of this in my moisturiser or face oil when I put it on , it really is lovely and feels very nurturing. My new crochet adventure. It could go in so many different directions. 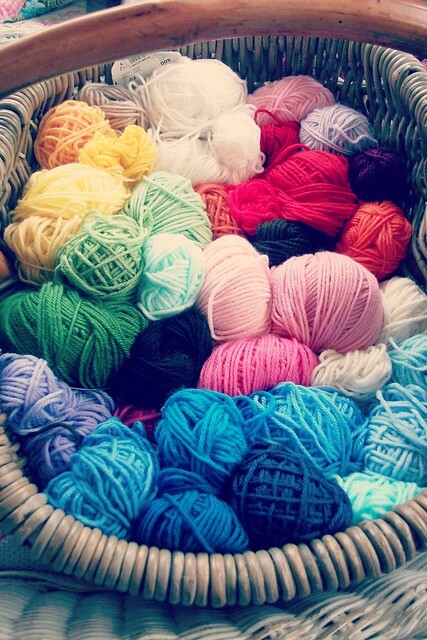 So many colours calling. I love this bit. Hmm, which colour wants to come out next. Actually I have an idea for this cushion, I'm thinking retro man!! You know the kind of retro man who you find under 'etsy dudes'! He will probably be wearing a plaid check shirt, drive a cool retro car and possibly have a beard. He probably lives in a cabin in the woods, which he built by hand and filled with cool retro things. And top of his shopping list would be a funky retro cushion, naturally....... Either that or he does actually live inside the 'etsy' website!...... Or possibly in another country.......or maybe I don't get out enough?! 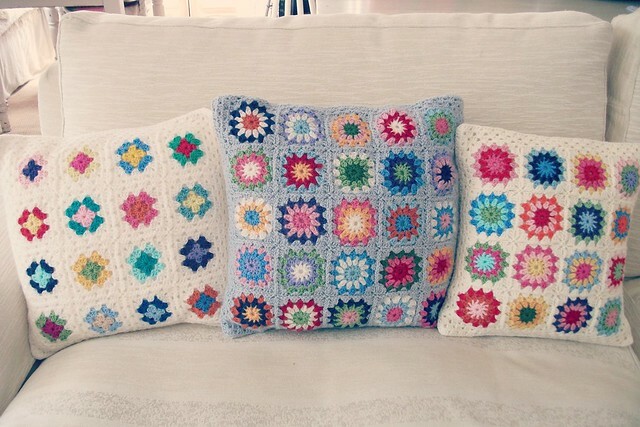 A quick crochet temptation here, look you can line them all up if you want to! Like I said always tempting to keep em'! 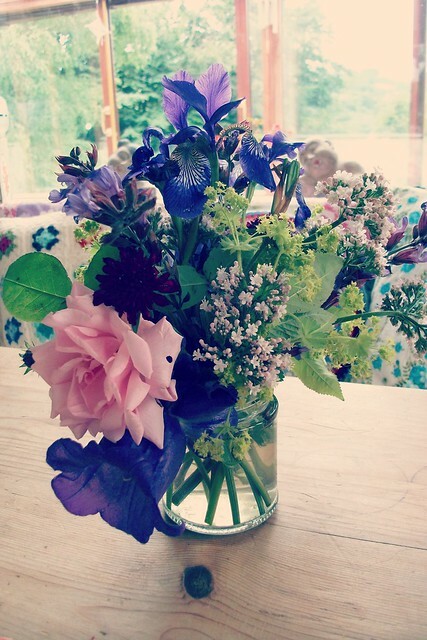 A sweet gift of summer flowers from a friend. Not tempting, just nice. and I have changed my photo. Once you have a photo it's hard to not have a photo, it kind of feels as though something is missing. It's quite a straight faced photo. I have some softer ones waiting in the wings, but this feels like something I need to express for a while! I detect a note of I mean business here and even a note of defiance, (possibly a now grey hair defiance!) and I may have my arms crossed, but I'm not saying. Just lately I have had to create some new boundaries around my life. Just nicely. There's important things in my life and my sons that I want to get to and I'm not getting to them. I have to be clear with myself and other people about that, I want to do them, but I can't if I'm spending time doing other things. I need to do the things which are important to us. First. Sometimes we can dance around these things for forever and a day with distractions and avoidances. Time to pull my finger out. Oh, and time to create. Time for everything. and let me know if you spot 'retro man'! P.S. I have some new pictures on my pinterest stunning grey hair board. P.P.S. maybe I'll start a 'retro man' board, what do you think!! edited to add retro man board here! Lovely post. The photograph of the rose is just beautiful! Your cushions are gorgeous! Lovely pics - fab crochet makes and I'd be tempted by that sweet red car too! 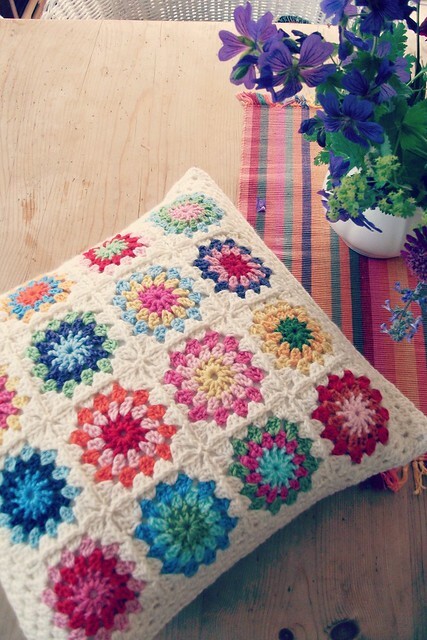 Ooh I love this colourful post, Heather! I'm sitting here with my hair dye on, afraid to go grey as my hair is short and curly and will instantly make me look extremely elderly if it were grey too. Yours is fab! Those cars are gorgeous ... I remember my husband telling me they were made for French farmer's wives, to take their eggs to market ... perhaps I need one, but my chucks are on strike at moment, so no hope for a glut of eggs for selling! 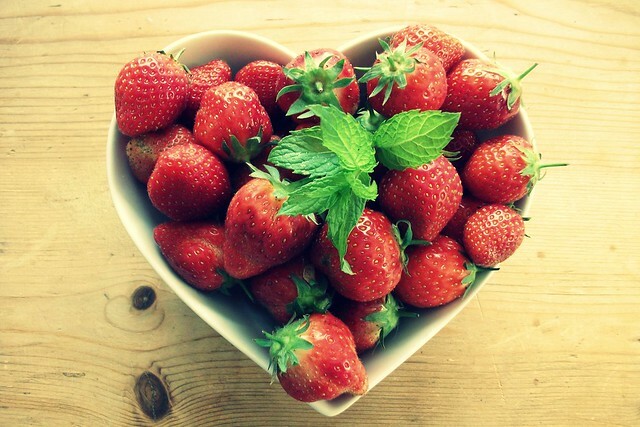 Sorry for rambling, must go ... forgot to say, how wonderful, free roadside strawberries! Yep, retro man is alive and well and living here with me, he still has that beard, and his cabin in the woods is now a wooden shed in the back garden! lol and we got married in the 1970's so yes he is the original retro man! LOL! yes, the go grey/dont go grey thing has been bugging me too lately, I have countless bottles of the colouring shampoo and yet not really keen to use it... I'm still thinking about it! I love this debate! Oh, I LOVE that car too! 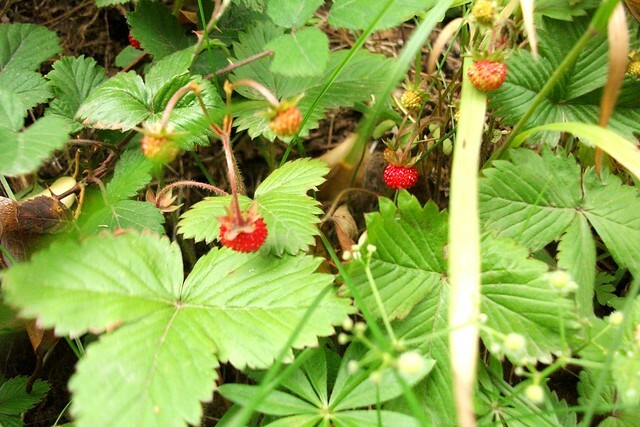 I have wild strawberries growing in the garden ... the flavour of them is so intense that they are almost fizzy! 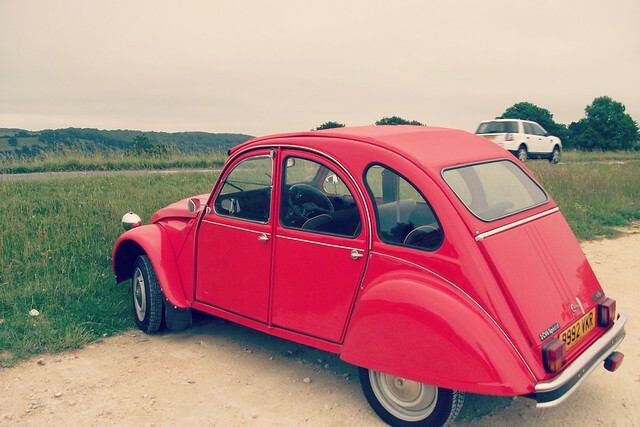 Love this vintage red Citroen.....how many memories!!!!! like the idea of a retro man board!!! Great!!! You are surrounded by beauty, and you have an eye for it. Some how I think that you could find beauty in almost anything as I always see you catching it with your camera, even in the dead of winter. I agree with you on boundaries, they are so important in our lives, it's often hard to get others to respect our personal and family boundaries though, so I admire you for the realization that they need to be there. I'm facing a problem with boundaries and my extended family at the moment. Also, I love your photo! I have decided to grow in my natural color and I'm finding so many grey hairs it's actually freaking me out! I don't know if I should embrace them or run from them! Anyway, I thing your photo is a very serious one, but lovely all the same. Lovely post again Heather! I can see you in the bright red car with your little suitcase but I think retro man might be an encumbrance you can well do without! Think carefully about this now! I remember the sweet lovely smell and taste of those wild strawberries from my childhood in Scotland - loved them! Many years on from childhood, I am sporting the now 'becoming-the-trend' grey hair which I haven't coloured for years and years: it started going grey when I was in my late twenties - a little strip on top of my head! Thank you for the link - I've found a couple of styles I quite like and am ready for a new cut! 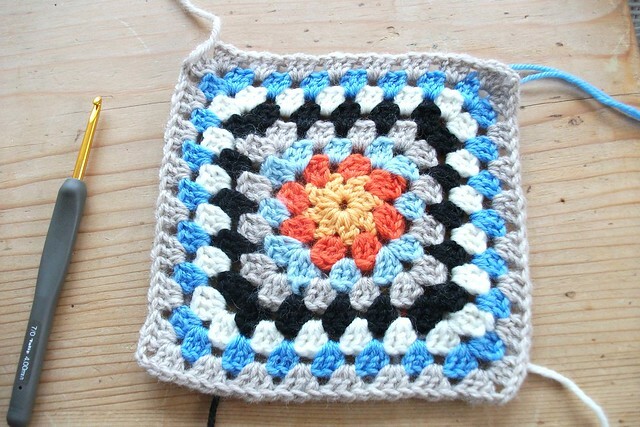 Your orange rose is beautiful, and your granny square and cushions - AND your new photo! Enjoy your creativity, let it flow through your days! Love your beautiful grey ladies - sadly I am not that lithe, elegant or blue-eyed (did you notice most are blue-eyed?!)... but I am still sticking to letting my hair grow out grey and then letting it get longer than the chin-length it has been for a few years, as it's basically decent, wavy/curly hair, just as I am short/curvy ;)! Great inspiration. Hi Heather,What a lovely post! !I like your retro man!! !Just make sure that he has a red car like that to give to you and that he wouldn't mind to stay at home while you go on a roadtrip with your Little Red Suitcase and your girl friends!!! Sounds like a wonderful plan!! !Can I come??!! I am dubbing your self-portrait "Decidedly Determined".